This entry was posted in Coyote Wind, Crazy Mountain Wind, Fairfield Wind, Greenfield Wind, Marty Wilde, Montana Renewable Energy, Montana Wind Energy, montana wind energy, Montana Wind Energy Projects, Permitting and Mitigation, Wind Energy in Montana, Wind Energy Site Development, Wind News, Wind Plant Design, Wind Plant Operations, Wind Site Prospecting, WINData Home, WINData Personnel, WINData Services and tagged Coyote Wind, Crazy Mountain Wind, Fairfield Wind, Greenfield Wind, Marty Wilde, Montana CREP, Montana Renewable Energy, Montana Wind Energy, Montana Wind Energy Projects, Montana Wind Projects, Mpntana CREP Projects, NorthWestern Energy, Permitting and Mitigation, Wind Energy in Montana, Wind Energy Site Development, Wind News, wind plant design, wind plant operations, Wind Site Prospecting, WINData Home and tagged Coyote Wind, WINData LLC. First pole goes up for Fairfield wind farm | KPAX.com | Missoula, Montana. This entry was posted in Coyote Wind, Crazy Mountain Wind, Fairfield Wind, Greenfield Wind, Marty Wilde, Montana Renewable Energy, Montana Wind Energy, montana wind energy, Montana Wind Energy Projects, Permitting and Mitigation, Wind Energy in Montana, Wind Energy Site Development, Wind News, Wind Plant Design, Wind Plant Operations, Wind Resource Assessment, Wind Site Prospecting, WINData Home, WINData Personnel, WINData Services and tagged Coyote Wind, Crazy Mountain Wind, Fairfield Wind, Greenfield Wind, Marty Wilde, Montana CREP, Montana Renewable Energy, Montana Wind Energy, Montana Wind Energy Projects, Montana Wind Projects, Mpntana CREP Projects, NorthWestern Energy, Permitting and Mitigation, Wind Energy in Montana, Wind Energy Site Development, Wind News, wind plant design, wind plant operations, Wind Site Prospecting, WINData Home and tagged Coyote Wind, WINData LLC. 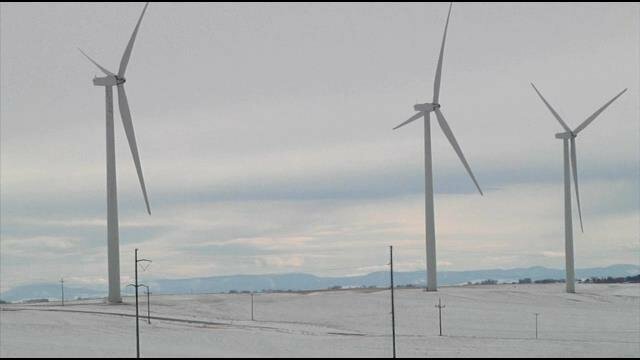 First pole goes up for Fairfield wind farm | KRTV.com | Great Falls, Montana. This entry was posted in Fairfield Wind, Marty Wilde, Montana Renewable Energy, Montana Wind Energy, montana wind energy, Montana Wind Energy Projects, Permitting and Mitigation, Wind Energy in Montana, Wind Energy Site Development, Wind News, Wind Plant Design, Wind Plant Operations, Wind Resource Assessment, Wind Site Prospecting, WINData Home, WINData Personnel, WINData Services and tagged Coyote Wind, Crazy Mountain Wind, Fairfield Wind, Greenfield Wind, Marty Wilde, Montana CREP, Montana Renewable Energy, Montana Wind Energy, Montana Wind Energy Projects, Montana Wind Projects, Mpntana CREP Projects, NorthWestern Energy, Permitting and Mitigation, Wind Energy in Montana, Wind Energy Site Development, Wind News, wind plant design, wind plant operations, Wind Site Prospecting, WINData Home and tagged Coyote Wind, WINData LLC. WINData, LLC: Overview | LinkedIn. This entry was posted in Coyote Wind, Crazy Mountain Wind, Fairfield Wind, Greenfield Wind, Marty Wilde, Montana Renewable Energy, Montana Wind Energy, montana wind energy, Montana Wind Energy Projects, Permitting and Mitigation, Wind Energy in Montana, Wind Energy Site Development, Wind News, Wind Plant Design, Wind Plant Operations, Wind Resource Assessment, Wind Site Prospecting, WINData Home, WINData Services and tagged Coyote Wind, Crazy Mountain Wind, Fairfield Wind, Greenfield Wind, Marty Wilde, Montana CREP, Montana Renewable Energy, Montana Wind Energy, Montana Wind Energy Projects, Montana Wind Projects, Mpntana CREP Projects, NorthWestern Energy, Permitting and Mitigation, Wind Energy in Montana, Wind Energy Site Development, Wind News, wind plant design, wind plant operations, Wind Site Prospecting, WINData Home and tagged Coyote Wind, WINData LLC.